Trying some more Prestige Classes for Witches. This one is actually quite near and dear to me. It was also one of the first Prestige Classes I ever wrote. The Imbolc Mage is a special sort of witch infused with the divine vengeance of the Goddess. They are nominal leaders of the Imbolc Guard. I wanted to create something that felt it could have been a part of witch history for a long time and work in the game. I had help from a good friend Lisa Countryman and her ideas on the original Imbolc Mage. The Imbolc Mage is her baby so I have kept the name closed for the OGL, but the rest is all fair game. Section 15: Imbolc Mage, Copyright 2013, Timothy. S. Brannan & Lisa Countryman. OGC Declaration: The terms "Imbolc Mage" and "Lady Imbolc" are closed in terms of the OGC. All other content is considered Open. Witches speak of Warlocks in hushed tones. Most are disgusted by these betrayers of the Goddess' law, but more than few also fear them. But there is one witch that even the darkest Warlocks of the Scholomance fear, for she is the righteous fury of the Goddess made mortal. She is the Imbolc Mage. The Mages of Imbolc are so rare that every single one has been recorded. Most have died in the pursuit of the Goddesses’ vengeance. Imbolc Mages exist to destroy evil, and they save a special hatred for those who call themselves warlocks. Like becoming witch, one does not chose to become an Imbolc Mage, the Goddess makes that choice. If the witch has the potential to become an Imbolc mage a series of tests and trails are performed by a coven 19 witches trained in the martial use of the sword. The witches who train the prospective are always of the strongest Neutral Good alignment. The test is a small price to pay and only a fraction of the battles the new Imbolc Mage will certainly face. The training is tough and many do not succeed. There is no dishonor in failure, it simply means the prospective was not destined to bear the mantle of the Imbolc mage. If the prospective does succeed, she is filled with the power of the Goddess and is known to all as Lady Imbolc. History records that nearly all Imbolc Mages have come from the ranks of strong witches. Amazon and Celtic Classical traditions being the most representative, but few chaste Tantric witches and a fewer number of Lorelei have served as well. Some druids and sorceresses have also become Imbolc Mages. With the rise of evil becoming greater more Imbolc Mages have been chosen and some have come from nonwitch backgrounds. In most cases the Imbolc Mage will join the Daughters of the Flame (q.v.) coven dedicated to the Goddess Brigit, but the Imbolc Mage works alone and is not considered to be a full member of that coven. Game Masters can choose a coven that suits their game the best. To qualify as an Imbolc Mage, a character must fulfill all of the following criteria. Feat: any metamagic feat, except Spell Kiss. Special: Imbolc Mages can only be female. In order to understand the nature of her foe, the potential Imbolc Mage must have survived an attack from an evil outsider. Note, survived does not mean she won or succeeded in defeating the outsider. Preferences are also made to witches that come from a strong family line of witches and have high Wisdom. Imbolc Mages are not made, they are chosen. So the GM and the Player who wishes to play an Imbolc Mage must decide on the particulars of this calling. Were her ancestors powerful witches? Did she have an Imbolc Mage in her family tree? Is there some new evil that requires a new Imbolc Mage be called? What were the circumstances with her battle with the evil outsider? The Imbolc Mage’s class skills (and the key ability for each skill) are Concentration (Con), Craft (Int), Diplomacy (Cha), Handle Animal (Cha), Heal (Wis), Intimidate (Cha), Knowledge (religion) (Int), Knowledge (witchcraft) (Int), Profession (Wis), Ride (Dex), Sense Motive (Wis), and Spellcraft (Int). All of the following are class features of The Imbolc Mage prestige class. Weapon Proficiency: Once becoming an Imbolc Mage, training in the sword begins. Regardless of original class, the Imbolc Mage can choose the sword and attack without penalty. Often the sword becomes the new ritual tool of the Imbolc Mage, replacing the athame. Unlike the athame, the sword is sharp and will be used for combat purposes. Most Imbolc Mages eschew the use of armor since it interferes with their spell casting abilities. Many will have several piece of magical protection in place. Special: The Imbolc Mage gains special powers at each level of her progression. Awesome Presence (Su): At first level, the Imbolc Mage is infused with the power of her Goddess. This supernatural ability has two main effects. First all witches can “see” this presence as a bright aura. Witches that know of the Imbolc Mage will treat her with deference and respect. Enemies, in particular warlocks, can also detect this aura. Any morale checks made by enemies are at a –1 penalty. Natural animals are also calmed by her presence. 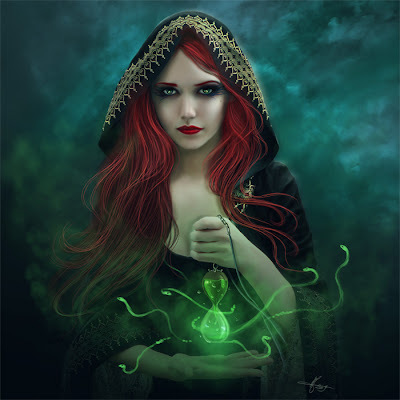 As a side effect of this change in her aura even the most good and lawful Imbolc Mages will appear to any magical scrying techniques as have a “touch of evil” about them. In all cases anyone who can see auras will see the Imbolc Mage’s aura is blinding bright. Favored Enemy (Ex): The Imbolc Mage gains Warlocks as a favored enemy as per the ranger ability. All attacks, mundane, magical or martial, are done at a +1 bonus at second level and gain by +1 for every two levels. GMs who wish to have more flexibility or do not wish to use warlocks might extend this favored enemy status to any type of evil witch, wizard or spellcaster. Wild Shape (Su): At fifth level the Imbolc Mage may Wild Shape once per day (take a shape and revert back). The shape maybe to any size that is one step removed from the Imbolc Mage. A medium-sized Imbolc Mage may wild shape to a small, medium or large creature. Unlike the Polymorph Self spell or druid ability, the Imbolc mage is restricted to natural animals. She may wild shape to a large dog, a lion or even a wolf, but never a wyvern or an owlbear. Typically the Imbolc Mage chooses one shape and sticks with that. This is a supernatural ability. Bilocate (Sp): The Imbolc Mage can astral project (as the astral projection spell) onto the same plane she is currently occupying, in effect being in two locations at once. The projection is semi-real and may do anything the Imbolc Mage could do, including cast spells and assume a Wild Shape. The Imbolc Mage cannot do anything other than rest, though both incarnations are aware and conscious of the others surroundings. The Imbolc Mage may hold this projection a number of minutes equal to her level plus 10, or until the projection reaches zero hit points. Any damage to the projection also damages the Imbolc Mage at one half the amount loss. She may do this once per day. This is a spell like ability. Ethereal Shift: The Imbolc Mage can enter the Ethereal Plane. For spell effects this is the same as if an Ethereal Jaunt spell were cast by a sorcerer of the same level. This may be performed once per day. This is a spell like ability. Astral Shift: The Imbolc Mage can enter the Astral Plane. For spell effects this is the same as if an astral projection spell were cast by a sorcerer of the same level. This may be performed once per day and is a spell like ability. Extended Life: Similar to the druid ability Timeless Body, the Imbolc Mage stops aging normally. Her aging is slowed to 75% of what is normal for her race. This supernatural ability also effects magical aging. Though this rarely aids her normal aging since most Imbolc Mages die due to violence rather than age. Spells per Day: The Imbolc Mage continues training in magic as well as the sword. Thus, when a new Imbolc Mage level is gained, the character gains new spells per day as if she had also gained a level in a spell-casting class she belonged to before she added the prestige class. She does not, however, gain any other benefit a character of that class would have gained (new Occult powers, metamagic or item creation feats, and so on). This essentially means that she adds the level of Imbolc Mage to the level of some other spell-casting class the character has, then determines spells per day and caster level accordingly. If a character had more than one spell-casting class before she became an Imbolc Mage, she must decide to which class she adds each level of Imbolc Mage for purposes of determining spells per day when she adds the new level. Generally speaking this will be her highest spell casting class. For example, Fionna is a 10th level witch and 2nd level sorceress. She is called to become an Imbolc Mage. She gains a level of Imbolc Mage and is now known as Lady Imbolc, and is a witch 10, sorceress 2, and Imbolc Mage 1. She opts to continue receiving witch spells, so she gains spells as an 11th level witch/2nd level sorceress, if she goes up a level in witch or Imbolc Mage then she will cast as a 12th level witch/2nd level sorceress. Typically though, the new Imbolc Mage will forgo any advancement in any other class she has and concentrate solely on her advancement as an Imbolc Mage. Imbolc Mages use the same spell list as witches. “A Bhrigid, scar os mo chionn, Do bhrat fionn dom anacal.